How close did Hitler come to an Atomic Bomb? The received story of German nuclear development in World War II goes something like this. Hitler and the Nazis didn’t even come close to developing an atomic bomb. They lost many of their brilliant scientists anyway because they were Jewish and fled to Britain or America because of Nazi persecution. Those German scientists who remained were way behind their counterparts in Britain and the U.S. in understanding nuclear reactions . They were in any case half-hearted about working on a bomb for Hitler and soft-pedalled, leading the Nazis to think the project was unachieveable. They lacked the industrial muscle to separate Uranium 235 on an industrial scale (like the Manhattan project) and didn’t even manage to build a working nuclear reactor. Their half-hearted efforts were hampered and eventually were over-run by allied bombing and the D-Day invasion of Europe. This is in some ways a comforting narrative – one that is much easier to deal with than trying to envisage London or New York after a nuclear explosion, and Britain and the U.S. on their knees begging Hitler for mercy. But how accurate is it? A 2009 book by Dr Jim Baggott, Atomic: the first war of physics, examines in detail the race to develop nuclear weapons by Britain, Germany, the U.S. and the Soviet Union, based on declassified documents and captured German archives and tells a fascinating story – one that is some important respects very different from the received view. Many German Jewish scientists did seek refuge in Britain and America. But those that stayed behind were first rate minds and included many scientists who had made the initial discoveries about nuclear fission. Indeed, in its infancy, nuclear fission was very much a German science. Nuclear fission was discovered in April 1939 by Otto Hahn and his assistant Fritz Strassman. Both continued to work at the Kaiser Wilhelm Institute throughout the war on nuclear chemistry, though neither worked specifically on a nuclear weapon. Werner Heisenberg, Germany’s most illustrious physicist was appointed by the Wermacht to run the Kaiser Wilhelm Institute, which they took over, and led nuclear research. While some of the German scientists might have been averse to mass killings, the fact is that most if not all of them saw the highest good of Europe in a German victory and German hegemony. In the first months of the war, German scientist formed the Uranverein – the “Uranium Club” – and set out to explore whether nuclear fission could be used either for energy in a reactor, or in a weapon, or both. All three teams of scientists working on the question – Britain, U.S. and Germany – reached the same conclusion within months of each other. American policy-makers received a similar report from Nobel laureate Arthur Compton in November. Compton estimated that, with access to a uranium-heavy water reactor running at 100,000 kilowatts for two months, the Germans could have enough plutonium for six atomic bombs by the end of 1942. It was this that galvanised the U.S. into action. That the Germans in fact lagged behind was to some extent down to luck. Both British and German scientists realised at an early stage that the uranium fuel in a reactor would need to be surrounded by a “moderator” to slow down neutrons so that they could cause fissions to take place, and that the most suitable material would be either graphite or heavy water. Of these two, graphite was far easier to produce and handle but one British scientist, Leo Szilard, realised early on that the graphite would have to be of extreme purity or it would not work. The Germans tried graphite but failed to spot that its effectiveness was negated by minute impurities caused by the manufacturing process. They thus dropped graphite and turned to heavy water – rare and costly to produce, difficult to handle and available to them only through the Norsk Hydro factory in occupied Norway. Their new interest in this plant tipped off the Allies that they were researching nuclear fission and caused SOE repeatedly to sabotage heavy water production, setting German research back significantly. If they had stuck to graphite, they probably would not have shown their hand to the Allies and they would have accelerated their programme forward by many months – perhaps to a fully operational reactor. But if they had bad luck over their choice of moderator, the Germans had (unintended) good luck on another crucially important front. Separating enough U235 for a bomb is a long, complex, arduous and costly industrial process, usually done by passing uranium in the form of a highly reactive and toxic gas, uranium hexafluoride, through hundreds of individual centrifuges. It was setting up and managing this colossal industrial endeavour in secret that was the great achievement of the Manhattan project. Producing Plutonium is much simpler, because it is a by-product of the reactions taking place in the core of a uranium reactor. Because it is chemically distinct from uranium it is easy to separate out in pure form – no need for complex industrial scale separation plant. Pure plutonium is twice as reactive to neutrons so you only need a piece the size of a grapefruit to make a bomb. However, plutonium was a brand new element at the time. It wasn’t even given a name until Glen Seaborg called it plutonium in 1941 and was simply referred to as element 94. Because it was so new and its properties poorly understood, it wasn’t taken up by the British and Americans as their primary aim. It was merely an afterthought, once they had got a reactor going successfully. Because the Germans, on the other hand, had only small quantities of heavy water available, they were compelled to focus all their attention on producing a reactor, rather than building a bomb. But this meant that -if they succeeded – they would automatically have access to plutonium for a weapon, instead of enriched uranium. They would, in fact, have won the race by quite a distance. The Allies also gained an important advantage in the race that was due in part to planning and partly luck. By August 1943, the War Cabinet had enough intelligence on German Rocket and flying bomb development to order a massive bombing raid on the Peenemunde research station – a raid that set back rocket development many months. Among many scientists killed in the raid was Dr Walter Thiel, one of the most brilliant designers of the V2 rocket. Thiel designed key features of the rocket motor that powered the V2, as well as a much bigger rocket engine for the A9/A10 intercontinental version of the weapon – designed to cross the Atlantic and attack America. In killing Thiel, the allied bombing raid not only deprived the Nazis of their most important rocket designer, they also killed the one German scientist who was seriously considering nuclear power as a means of rocket propulsion and also seriously considering nuclear power as a weapon of war. Thiel acted as the liaison officer between the Peenemunde research station and Professor Heisenberg, the atomic physicist now in charge of nuclear weapon research at the Kaiser Wilhelm Institute. After Thiel’s death, interest in marrying atomic power and rocketry subsided and shortly after, the A10 rocket project was cancelled. The final question is perhaps most fascinating of all. 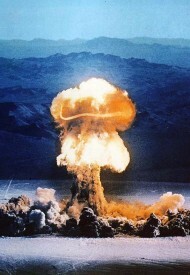 If Hitler had acquired a plutonium bomb in 1944 or even 1945, what exactly would he have done with it? His main strategic aim in the west was to defeat the allies so he could carry out his eastern plan to occupy the lands of the soviet union unhindered. He had no strategic wish to crush Britain and its empire – indeed, he had long dreamed of an “Aryan” partnership. He would probably have hesitated to destroy London. It is more likely that he would have demonstrated his nuclear capacity to the Allies by destroying a target that to him was unimportant and for whose inhabitants he cared nothing. Where this would have been is anyone’s guess, but the mind boggles at the possibilities. Moscow? But this would leave the capital of the new German eastern empire contaminated. Paris? But this would destroy a favourite playground for German officers. A more likely target would have been New York.Such a coup would have taken America out of the war at a stroke and prevented the D-Day landings. America would have been powerless to retaliate and would have been relegated to minor status for generations. The war would have been ended overnight and Hitler free to carry out his plans. Looked at in this light, the Allied development of nuclear weapons was not only vital, it was also a close-run race. Next Next post: Did the Civil War make the U.S. leaders in global trade?